It's been over a year now that I made the decision to completely give up alcohol. I therefore wanted to share how that year went, as well as the pros and cons I have experienced since ditching the drink. 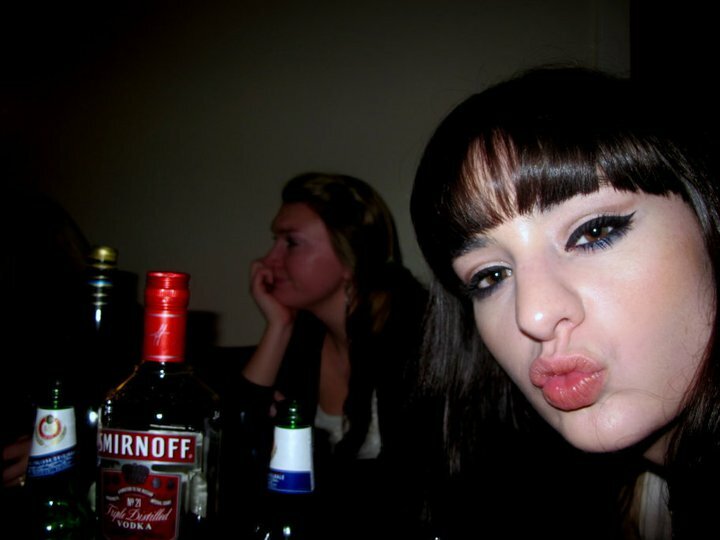 Bonus: take a trip down memory lane with lots of pictures of me looking horrendously drunk (you're welcome). WHEN DID I GO SOBER? In 2017 it was my New Year's Resolution to ditch alcohol completely. The year before that, I made the decision to not drink as much. So when I was drinking, I tried to opt for just one or two glasses of wine. Unfortunately, this well-intentioned method didn't work out too well for me; after one or two glasses, I almost always wanted more. This resulted in a couple situations where I got a bit too drunk and woke up feeling awful. It was these situations that pushed me to give it up totally this past year. I started drinking heavily from when I was around 15 years old, carrying on the binge drinking lifestyle into university. It's very normal for people at that age (where I am from at least) to get into drinking, and I wasn't any different. But I always took it a little too far. I always pushed myself to get as wasted as possible. To push my limits and chase the feeling of being drunk. I was that friend. After four heavy binge drinking years at university, I continued this party lifestyle after I graduated. I was struggling to find a secure job and for the first time was long distance with my boyfriend. My struggles therefore manifested themselves in drinking away my sorrows at the weekend, often partying for days on end. Sadly this became a vicious cycle for over a year after uni. In 2016, something snapped, and I realised I didn't want to be doing this anymore. I acknowledged the negative impact it was having, the money I was spending, how it made me feel, and how I was using it as a distraction from the problems in my life and the situation I had found myself in. So I made the scary decision to move home, start a YouTube channel and finally ditch the binge drinking lifestyle. And the rest is history! So there obviously isn't one size fits all, and everyone is coming from a very different place when it comes to alcohol. But my best advice is to find a why. Why do you want to give up alcohol? For me, it was because I knew it wasn't improving my life. I wanted to get healthier, to stop covering up my problems with alcohol and to put time and energy into pursuing my dream career. I wanted to let go of something that I knew was controlling me and to finally escape the hold that it held over me. That in itself allowed me to stay motivated and go full force into maintaining sobriety. You may want to build a closer relationship with your loved ones. To get fit and healthy. To really find out the issues you're covering with alcohol. Figure out what it is. Ask yourself why, write it down and focus on it. Finding the why for your goal is the biggest step in this journey. In any journey in fact. If you are dealing with serious alcohol addiction, then please seek help. There is no reason to deal with this alone. Talk to a loved one, talk to a friend, talk to a doctor and seek the help that you need. This was something I definitely experienced to begin with. I had a period of time where I had to get used to going out with friends and not being a part of the drinking activities. I know this is a huge road block for many others when attempting sobriety. While it may be hard to start with, it takes time and eventually becomes pretty easy. There is an adjustment period, but what helped me was distancing myself from that lifestyle. I stopped clubbing, I stopped partying and I started to spend time with friends in a different context. I hung out with them in the day time, had dinner with them, went to their house for a cup of tea, went out for a walk. It was just a matter of switching things up and focussing our time on other things not involving alcohol. There were definitely times when I find it awkward being the only one who isn't drinking. I've gotten tired and irritated that everyone around me is drunk and disorderly. But again, this is just something you have to get used to, and at least you can have a good laugh at your friends when they're hungover in the morning! When I was no longer relying on alcohol to have fun, I did at times feel a little left out. I look back at many drunken memories as fun times I had with friends and drinking has been a huge part of our bonding experience. There was a fear that when I gave up alcohol I would miss out on all of that fun and my friends would no longer enjoy my company. Most of this however was just fear, and not reality. Especially now that I am older, and a lot of my friends have grown out of that period of their lives also, I really don't miss out on much at all. And you know what? I actually enjoy being a grandma who goes to bed early and enjoys a cup of tea in bed, more than a glass of wine late at night in a bar. When I first gave up alcohol, I definitely felt the pressure to drink. It certainly helped that I made the transition slowly, spending a year reducing my alcohol intake before I went completely sober. This not only helped me to adjust, but those around me. However, there were a few occasions when I felt confronted about my choice. There were times when everyone was celebrating and having a drink, and I would say no. Those around me would ask "But why? ", "Why can't you just have one drink? ", "Why does it matter?". It wasn't necessarily because they were trying to be mean, or bully me into a drink. It was because they were used to me drinking, and being a part of that celebration. That was how we had connected in the past. Humans bond over food and drink. And if you turn around and say no to that, it can be seen as rude. They weren't used to the new me, and change can be hard to understand. On top of that, I never went through serious alcohol addiction. From their point of view I had a fairly normal relationship with alcohol. So when I made this lifestyle change, it took time for them to fully get their head around why I had made this choice. Now that I have adopted this lifestyle for some time, I no longer get these kinds of remarks. But there was naturally an adjustment period for those around me to fully grasp why I gave it up. Anyone who is sober has been asked "why?" Every time I am in a social situation with new people and they don't know that I don't drink, it tends to get brought up. 'Oh, so why did you give it up? ", "How long have you been sober? ", "But why?". It is a little awkward to begin with, but in all honestly it actually opens up an interesting conversation. Most of us have been hungover, done stuff we regretted, woken up feeling rotten after a heavy night, and therefore most people tend to see where I am coming from. I no longer feel as confronted by this question as I did at the start. I can confidently answer this question without feeling insecure or weird about it. I can open up to people about my struggles and how much better I feel since I ditched drinking. And the best part is they get to see me having fun, while sober! Now onto the good stuff, the pros! Thankfully the pros far outweigh the cons (which are easily brushed off anyway) and have kept me motivated throughout the past year. I no longer have to wake up the day after drinking, feeling like utter crap, often sleeping in until noon and wanting to eat everything in sight (once I do eventually make it out of bed). Good riddance hangovers! This is probably one of the biggest motivators for me and has helped me maintain my sobriety. I have had so much more time to focus on me. My hopes, my dreams, my goals. Since giving up alcohol, I have started up a career online and made it my full time job. I don't think I would have been able to achieve this, had I continued drinking. Drinking was my weakness, it fed my insecurities, and letting go of it was a shockingly powerful thing. This self reflection and focus has been invaluable to my success and happiness. I suffered from an eating disorder for many years and in hindsight, I truly believe that my alcohol consumption and binge drinking played a huge part of it. As I no longer drink, I also no longer feel the need to uncontrollably binge on foods after a long heavy night of drinking. I would binge drink at night and binge eat the following day. The result being I felt like utter crap about myself. This was how I gained lots of weight, started to hate my body and developed an eating disorder. It continued for years in a vicious cycle, fuelled by alcohol. Though I begun recovery from my eating disorder before going sober, I came to the realisation that alcohol was a trigger for me. I couldn't control my binges after a night of intoxication, and this only encouraged an unhealthy relationship with food. Removing this trigger from my life has therefore pushed my recovery further, enabling me to continue to develop a healthier attitude with food and my body. Funnily enough, I used to think alcohol enabled me to let go of my insecurities and inhibitions. Since giving it up, I have realised it is the exact opposite. I've had more time to focus on my confidence and solving my problems, rather than burying them in a glass (or five) of wine. I now have the time to focus on what is troubling me, and actually deal with it. I have built confidence in myself, as opposed to going from shy when sober to obnoxiously loud when drunk. Sadly, I only came to this realisation when I gave up alcohol. I never thought alcohol could be fuelling my problems or insecurities. After all, it made them feel like they disappeared! My answer to stress was to open a bottle of wine. My solution to an argument with my boyfriend was, "Right, it's the weekend, time to get drunk!". But hindsight is a powerful thing! Only now can I see how sad and lonely alcohol made me feel. How much I was using it to drown my sorrows and hide my insecurities. Now I can maintain a more consistent and stable relationship with myself and others. Instead of drowning my sorrows, I face them. Instead of hiding my insecurities, I overcame them. Ditching alcohol has also had a really positive impact on my personal relationships, in particular with my boyfriend. We used to argue when we drank a lot at uni, having a go at each other for something stupid neither of us would even remember in the morning. Thankfully we have left that part of our relationship behind. I can remember the things I say and do to people, and I have more control over what I'm saying or doing to them. I don't need to use the excuse of "I was drunk! ", because I am accountable for my actions. I care about how I behave and act towards others more and treat them with more respect as a result. I have also let go of relationships that weren't making me happy. I don't waste my time attempting to fit in with groups of people who will never make me feel like myself, or bring me happiness. It's probably no surprise that I feel a lot healthier! And it's no secret alcohol makes you feel like crap. I mean, your body sees it as a poison. No more excruciating hangovers or binging out on foods that make me feel awful. I feel clearer mentally and I no longer regularly experience regret or anxiety. I spend more time on my fitness and taking care of my body over all. My physical and (even more so) mental health has improved so much since becoming sober. Without alcohol, I'm no longer wasting my evenings and the next day, drinking and being hungover. I have literally more days in the week to spend pursuing activities and passions of mine. I've ended up being able to travel, build new friendships, work on my spirituality and career. I have had a lot of introspection and growth over the last year, that I don't think would have happened if I was still drinking. This is one of the biggest pros. I definitely used to spend more money on alcohol than on food. I am now able to live a much more comfortable lifestyle with my finances, no longer wasting it on drink. I have been able to save, travel and invest in my career and quality of life. And finally, my focus has switched from complaining, moaning and feeling sorry for myself, to celebrating, improving and being grateful. I was always in this cycle of trying to work hard and trying to improve, but never getting there because every time anything went wrong I'd drink and end up back at square one. Now I have a better outlook on life, I am able to pour myself into everything I do. The positive mindset that I have developed over the last year has definitely surfaced as a result of the lack of alcohol in my life. I'm not telling you that you need to give up alcohol, everyone has a different experience with it. What I hope by sharing this is that I can inspire those of you who have experienced something similar to me, to question it. What does alcohol bring to your life? Happiness or sadness? Stress or relief? Productivity or a distraction? Whatever your answer, it's important we question things we do in our lives to find out if they are truly serving us or not.